When it comes to improving your ranking on search pages, then you must have the comprehensive and thought-out SEO strategy. Through implementing the effective strategies, you can improve your website’s visibility, this gaining traffic and revenue. Yes, off-page tactics such as link building are crucial. However, on-page SEO is just as important, with search engines now focusing on both authority and the quality of content you provide on the website, as well as its relevance, structure, and the user-friendliness. That’s why it’s essential to take care of these aspects, which will have you succeed. Before, SEO tags have had a significant impact on one’s ranking. But today, these SEO tags are a controversial aspect when talking about on-page SEO. It has many wonder: Which tags are crucial and which ones should you not mind? To help you learn more about SEO tags, I show you all the tags one uses in SEO and which are important to still use. The title tag is found on the header section, which would specify the webpage’s title. It’s the clickable headline on search engine results pages and would show up on browsers and social networks. Title tags provide the clear idea of what the web page’s content will be about. Well-written titles can provide the higher rankings, as it’s the first thing searchers would see, deciding if it’s the page they’re looking for. Good titles would increase traffic and clicks, which in turn, can bring a bit of impact on your rankings. Search engines don’t require having your exact match keyword anymore though, so you can see that they are becoming smarter in understanding your page’s content rather than just the keywords alone. Meta descriptions are found underneath your title tag and also underneath the header of a webpage. It’s usually displayed as a snippet on the search engine results page, along with your title and the webpage URL. The reason why meta descriptions exist is to reflect the content of your page, providing more details compared to the title tag. However, meta descriptions aren’t the official ranking factor on SEO for almost ten years. But just because it isn’t as important as other tags doesn’t mean it won’t make an impact. Your meta description would occupy a large part of the search engine results page snippet. It will invite different searchers to click on your page because of it. Because the description can impact the number of clicks your page gets, it will be able to improve your CTO while decreasing bounce rates. 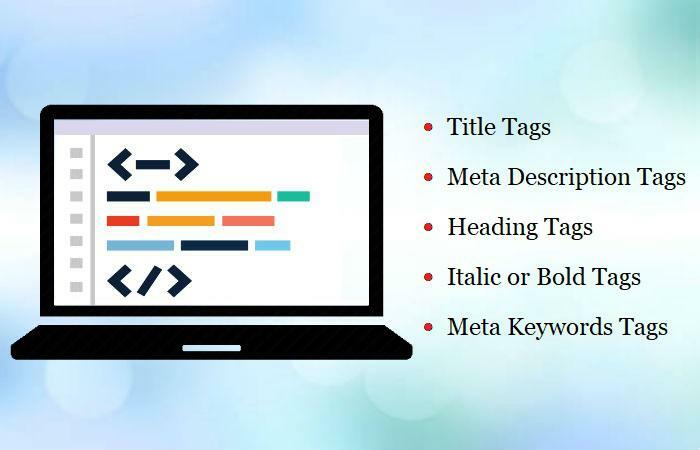 These are HTML tags which identify headings or subheadings in your content. There are different types of headings, from H1 to H6, which are enumerated in a sense of how “important” they are. H1 is a main heading on your page, which has the prominent tag that shows what your page is all about. H2 to H6 are simply optional tags which organize content, which makes it readable and easier to navigate for your readers. There is some debate on the importance of heading tags to SEO. While the H2 to H6 tags aren’t as important to search engines, the H1 tag is emphasized in various studies. Also, using H1s inappropriately may risk your chance of having a major ranking and traffic. In the end, using heading tags can help add to your content’s architecture. It’s easier to read and understand compared to crawling through content with structural issues. Also, it’s easier for readers to take in your content. Both of these factors can raise your optimization. Italic and bold tags are used when highlighting crucial parts of your content, adding emphasis on specific words. Bots would appreciate these tweaks but they won’t care as much as they would with other tags. It helps with readability and user experience, though! Image Alt Attributes are added to image tags, which describes the contents. They are essential in on-page optimization because alt text is displayed to visitors if images can’t be loaded. Also, alt attributes give context to bots as search engines can’t “see” photos. When you want to get to most for your on-page SEO strategies, make sure that you take care of all the details which will add up to the big picture. Yes, some SEO tags are still vital, making up the taxonomy of the website. And while others aren’t as important, they can still keep you ahead of your competition that doesn’t bother with it. I hope that these important tags to use in SEO gave you an idea on what to change for your website. So don’t wait any longer and begin understanding your website better for search engines to discover today. If you have any questions or want to share your experiences on search engine optimization, then comment below. I would love to hear what you have to think.